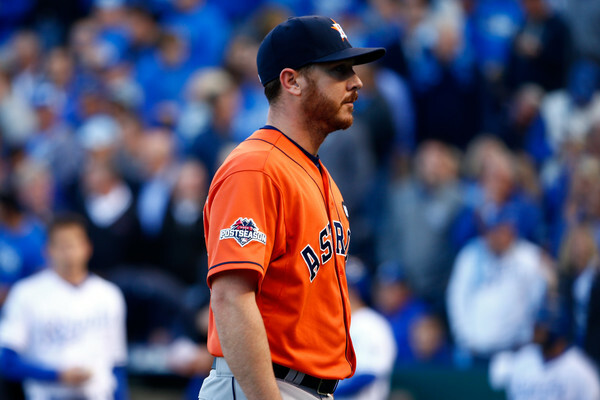 The ink is barely dry but the Dodgers have made their first big dip into the free agent pool this offseason, signing left-handed pitcher Scott Kazmir to a 3-year $48 million deal. The rotation, an obvious glaring need after the departure of Zack Greinke, has been boosted as the Dodgers seek to continue their long standing dominance over the National League West. Scott Kazmir under no measurable statistic is Zack Greinke. He is no replacement for Greinke and his otherworldly numbers of last year. Whilst he is a far cheaper option, the reality is that the financial expenditure is of little consequence for the Dodgers brass, and this screams “get someone” as they lament the loss of their former star. In his own right Kazmir is a very good pitcher who, in spite of his struggles after a mid-season trade to the Astros, had a good season to the tune of a 3.10 ERA and 130 ERA+. After having the best spell of his career during his year and a half in Oakland, Kazmir fell off a cliff in Houston. Sporting a 5.19 FIP and a scarily low 6.6 K/9, the Dodgers will be hoping for this to be a temporary loss of form and not an indication of a decline. The Dodger will enter 2016 with a lefty heavy rotation with Kazmir joining Clayton Kershaw, Hyun Jin Ryu, Alex Wood and Brett Anderson, but decided to solidify the rotation with the best player available. For Scott Kazmir this contract really completes his wonderful reclamation. After four really impressive years in Tampa Bay from 2005-’08, culminating in an AL pennant, Kazmir started 2009 poorly before saving his season in Anaheim after a mid-season trade. In 2010 Kazmir had the worst year of his career, a 5.94 ERA and a woeful 4.7 BB/9. Released in 2011, Kazmir found himself on the metaphorical scrapheap. Most reasonably assumed the last meaningful impact Kazmir had was in the past and his career would fizzle out like many before him. Cleveland took a flier in 2013, and Kazmir duly obliged with a solid, but unspectacular 94 ERA+ with a 4.04 ERA. The peripherals and indications were that those numbers were a bit harsh on Kazmir’s overall performance. This provided dividends as Oakland took on Kazmir and he provided a superb 5 rWAR in just 300 innings during his stint in the Bay Area. A great recovery overall, as it would take a cold man to begrudge him his money and job security. For those still requiring pitching, Kazmir perhaps was the last pitcher where a three year deal was a viable option. The best remaining arm on the market is Wei-Yin Chen, with rumors circulating that he’s in line for a nine-figure contract. After him and Yovani Gallardo, who one would assume will receive a larger contract than Kazmir, the pitching market is very thin. For teams in need of rotation upgrades, its fliers, reclamation projects and/or sub-par players left to fight over. Whilst the allure of Mat Latos is to try and restore him to a former production at a fraction of the price, there’s a very real possibility that it won’t happen. In terms of likely production, it’s getting bare. Previous Previous post: Doug Fister: The Next Pirates Project?